Mah is expected to be the first Asian-American legislator in Illinois state history. Democratic nominee for representative of Illinois’s Second District Theresa Mah (Ph.D. ’99) gave a talk on her public service career and decision to run for office at the Institute of Politics (IOP) on Monday. The talk was hosted by the Leaders of Color initiative, which seeks to promote racial and ethnic diversity in various leadership positions on campus. Mah is expected to be the first Asian-American legislator in Illinois state history after winning a contested primary with 51.22 percent of the vote on March 15. She won despite running against Alex Acevedo, son of the incumbent 2nd District Representative Eddie Acevedo. Furthermore, the district had a 53 percent Latino voting-age population and a 23.5 percent Asian-American voting-age population. She is currently running unopposed in the general election on November 8. Mah cited her personal background of coming from a Chinese immigrant family as a core influence in her decision to run for office and work in public service. Her grandfather arrived in San Francisco in 1924 and was part of a generation of immigrants known as “paper sons,” who had to buy papers in order to enter the country due to the Chinese Exclusion Act and the naturalization laws in effect at the time. She was born three months after her parents emigrated from Hong Kong. According to Mah, she never planned on entering public service as a student, although she always knew she wanted to be a voice for the underrepresented like her grandfather. She started her undergraduate years at UC Berkeley as a pre-med student before switching to history due to the influence of her first-year roommate. Writing her dissertation on the politics of housing segregation while pursuing her Ph.D. made her realize how much impact public policy decisions have on people’s everyday lives. Mah had volunteered on various political campaigns for over ten years, serving as senior policy advisor to Governor Pat Quinn and rallying the Chinese-American community to push for single district in the last round of redistricting, before finally deciding to run for office herself. “You can only get so much done as an advocate. At a certain point, you need a seat at the table, to have access to other decision makers and to be able to influence them,” she said. Mah had worked with the current Second District Representative Eddie Acevedo in 2012 and felt that he did not have the community’s interest at heart. So when he announced his retirement and tried to get his son Alex Acevedo appointed so that he would have the advantage of running as the incumbent, she jumped on the opportunity to run for the Representative seat herself. “Since I knew [Eddie Acevedo’s] son, I knew that he was nowhere near as qualified [as I was] and I didn’t want him as my state representative so it became an obligation…you had to do it yourself,” Mah said. Mah said that the biggest differences people will see when she steps into office will be her accessibility and accountability to the members of her district. In addition, she stressed her independence in only serving her constituents as she ran a completely grassroots campaign without being beholden to special interest groups. In addition, she hopes to use her role in office to advocate for Asian Americans and for illegal immigrant issues. The event was co-hosted by the Asian Students' Union, the Chinese Undergraduate Students Association, Lambda Phi Epsilon, alpha Kappa Delta Phi, PanAsia, and the University of Chicago Democrats. Nearly seventy people were in attendance. 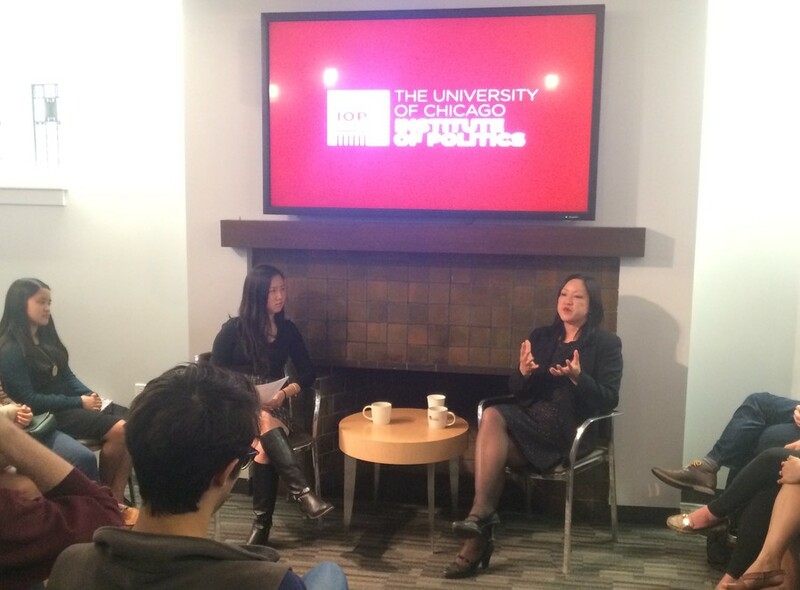 “I thought it was really empowering to hear about how being Asian doesn’t preclude you from a career in politics. It was very inspiring to see someone whose grandparents immigrated illegally to the United States, whose parents didn’t speak English and ran a small business, could end up somewhere where she is right now–someone with a Ph.D. and a seat in politics…I think it marks an important step forward in Asian-American politics,” said Vo Ram Yoon, a fourth year Public Policy major.